The original Para Warthog is the world's smallest .45 ACP, 10+1 round, semi-automatic pistol. The compact frame makes it easy to carry into any situation, yet the small size won't mean a sacrifice in stopping power. Nighthawg - Para's special edition Nite Hawg has all the power of the super compact Warthog, while boasting a non-reflective all black finish and tritium night sights.Despite its small size, the Nite Hawg is also remarkably controllable, thanks to its superbly engineered and contoured grip design. Hawg 9 - These pistols were designed around the powerful .45 ACP cartridge and, when you asked for PO to chamber it in the popular 9mm Luger cartridge, their ramped barrel provided plenty of meat in the chamber - even for + P 9mm loads. 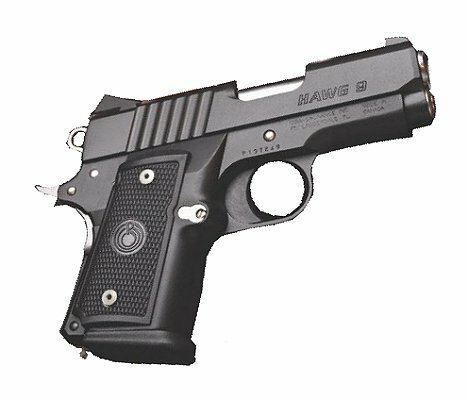 In 9mm this baby "Hawg" is sweet shooting and it holds 12 rounds in the full capacity magazine. A 10 round restricted capacity option is also available.